Beginning July 1, 2007, JASN will come under the direction of a new editor-in-chief, Dr. Eric Neilson, and a new editorial team selected by him. Reflecting that changeover, next month JASN will appear in a new style and format with new categories, new features, and new directions. It is time for that change. As the current team finishes our 6-year term and relinquishes a responsibility that has been a central part of our professional lives since July 1, 2001, it seems appropriate to record some comments on where we have been and to offer some perspectives on where we are going. First, the data. This editorial team began our term with lots of ideas, plans, and energy (1), and we finish with a great sense of satisfaction with what we have accomplished. Since we published our first issue in January 2002, we have received and reviewed more than 6500 submitted manuscripts, using the online services of Manuscript Central. During our term, annual submissions increased 30% through 2006 and are currently on track to increase another 20% or more this year. Of these more than 6500 manuscripts, more than 1400 were guided through the process of revision and eventually published in JASN, an overall acceptance rate of approximately 22%. Because submissions have risen every year and the size of the journal has been intentionally maintained constant at approximately 300 pages of peer-reviewed material per issue, the acceptance rate has fallen from approximately 30% to the current 20% (14% in the clinical sciences and 24% in the basic science categories). Despite the increase in submissions and workload, our time from acceptance to print publication has fallen dramatically from more than 7 mo in 2001 to less than 3 mo now, and JASN Express, inaugurated in 2004, provides on-line publication of copyedited papers within 6 wk of acceptance. Because the quality of papers that are submitted to JASN has improved, we have been in the fortunate position of being able to set very high standards for the material that we review and publish, particularly in “hot” categories that include clinical trials, DNA array studies, and genetic studies that involve single-nucleotide polymorphisms (2). Studies of basic cell biology and signaling are now rarely reviewed by JASN unless they include in vivo correlates for studies that are done primarily in cell culture. Concomitantly, we have initiated and increased the practice of “triaging,” without full review, papers that are deemed by the editor and responsible associate editor not to meet our criteria or to rank in the lower 50% of submissions and therefore unlikely ever to earn a publishable priority score. This practice, although alleviating reviewer “burnout” and helping authors to submit their rejected papers elsewhere quickly, has sometimes discouraged authors, but the increased selectivity has been good for the journal. As competition for space has increased, so has the quality of papers that we are publishing and their impact on the world of renal science. The origin of the published contents of JASN was global in 2001 and remains so. Approximately two thirds of our submissions are from outside North America. The number of submissions and acceptances from developing countries has also increased steadily, particularly from China. JASN has remained the top-ranked journal in the kidney/urology field as assessed by the impact factor score calculated by the Institute for Scientific Information (from 5.75 in 2000 to 7.24 in 2005, the latest year for which figures are available) and has increased its lead over our competitors. Those numbers, flawed as we know they are, remain the best and most widely accepted objective measure of the quality of research that we are publishing in JASN and represent a tribute to the editorial team that has worked so hard to bring the best research available to the American Society of Nephrology (ASN) membership and all of our other readers. In an ongoing effort to make the contents of JASN more easily appreciated by its clinical audience without diminishing our status as the premier research journal in nephrology (3), we have commissioned more editorials (two or three for each issue) to provide context and meaning for the most significant issues raised each month by the research material. We increased the clinical content from approximately one third to almost one half of articles published and created two new categories, Chronic Kidney Disease and Clinical Epidemiology and Outcomes. “Highlights” were instituted at the front of each issue to provide short synopses of the eight most interesting basic and clinical articles (four of each), written to convey the significance of the findings to general readers. We also inaugurated “Frontiers in Nephrology,” published usually four times a year and hosted by guest editors, to cover a single clinical topic from bedside to bench beginning with a clinical review and progressing to summaries of where the current research frontiers lie (such as our Frontiers on PKD in last month's issue) (4). With the cooperation of the new editorial team, two more Frontiers in Nephrology will appear this year before the feature ends: Tolerance in August, edited by Peter Heeger, and Vascular Biology in November, edited by Michael Goligorsky. “Nephrology Beyond JASN,” written each month by Eberhard Ritz, has provided readers with in-depth analyses of the significance to nephrology of selected articles from the nonrenal literature. In 2005, we began publishing “Fast Tracks,” shorter papers for accelerated review and publication, with the most cutting-edge clinical or experimental findings of unique importance to nephrology (5). The format of the journal has also evolved in the past 6 years. In 2003, we modified our printing and layouts and changed our title from the Journal of the American Society of Nephrology to officially adopt our nickname JASN (6). In addition to implementing all of these changes, we changed publishers in 2004 from a long-standing arrangement with Lippincott Williams & Wilkins to self-publication by ASN, a transition that has not been problem-free. During our tenure, we have also participated in changes in the way the ASN has provided information to members. The JASN Web site (http://JASN.asnjournals.org) was launched in 2000 with archived issues, and in 2004 “JASN Express” began providing new articles to subscribers in advance of their actual print publication in the following issue. (All JASN articles are available online to the general public 1 year after publication.) In September 2002, NephSAP, edited by Dr. Richard Glassock, began publishing on alternate months a series of in-depth clinical reviews with continuing medical education questions for credit. The ASN clinical journal, CJASN, edited by Dr. William Bennett, came into publication in January 2006. So we come now to the end of our term as custodians of the most highly ranked journal in nephrology and the flagship publication of the largest and most respected society in nephrology. Indeed, JASN represents the ASN′s most visible single commitment to nephrology's long-standing roots in the basic sciences, now expanded to incorporate a burgeoning investment in the clinical research sciences of epidemiology and outcomes research. Although the trajectory has been steadily upward, the future is not without challenges. The biggest challenge, but also the most pleasurable, is to ensure that the material published in JASN covers the spectrum and represents the best of the most exciting research advances in our field, many of which are well illustrated by articles in this issue and highlighted on the cover, the last JASN cover designed by the outgoing editorial team. Other challenges will be more daunting. I will touch on only three. A significant threat to all subspecialty society journals, not JASN alone, is the increasing demand for open public access to all published science (7). Although the proponents of free open access are well intended, journals such as JASN not only serve as important member benefits (in a recent membership poll by ASN, JASN was ranked above even Renal Week as an ASN member benefit) but also represent a significant revenue stream that sustains other important activities of the society, such as fellowships, research grants, travel grants, basic science meetings, and others. If membership or subscriptions are no longer required to access the material published in JASN, then this will likely have a negative impact on society membership and thereby reduce support for critical programs that are not self-supporting. This threat already exists in the form of site licenses that are sold to medical libraries in universities and elsewhere, which then offer electronic journal access free of charge to students and faculty, but the numbers of those with free access to university libraries is still small. Nevertheless, JASN's current policy of offering open access 12 mo after publication is likely to be revised downward to accommodate increasing demands from both federal and private research funding sources. The challenge of continuing to provide a hardcopy journal that provides sufficient value to justify the cost to members when free electronic access becomes immediately available to everyone will be a substantial one for the new team. A related concern is the real threat of extinction faced by the physician-scientist, particularly in the United States. The physician-scientist has always represented a substantial component of the physician community in this most intellectually challenging of subspecialties and is the source of the fuel that drives a journal such as JASN: investigator-initiated original research. There has been some encouraging recent progress in this area (8). However, plagued now by impossibly competitive federal research grant pay lines that now dip below 10% in some areas, mounting bureaucracy in the form of institutional review board and animal care requirements, faculty effort certification demands in the face of federal prosecutors' threatening fraud charges, and low pay and insecure career opportunities that are too often grant dependent, the “best and the brightest,” very understandably, often find research careers unattractive. If the United States cannot find the means to protect and nurture this critical component of its health care enterprise, then it will lose it, and journals such as JASN will suffer as well. This is not a problem that the next JASN editorial team can solve, but it is one on which all components of the ASN must work together to publicize and to advocate for changes in public policy such that individuals who are interested in pursuing basic or clinical research careers are not penalized for doing so as they are now. A third future challenge, more internal in nature, is the splintering of the nephrology community into increasingly disconnected research and clinical segments (not to mention further splitting into dialyzers, diabetologists, transplant physicians, etc.). As basic science has become more molecular and complex, the ability of the busy clinical reader to understand and appreciate what is occurring at the frontiers of the specialty has diminished, and its relevance may seem hard to appreciate, yet we work in a discipline that has historically been more firmly rooted in basic sciences such as physiology, pathology, and immunology than any other, a fact that has given nephrology an intellectual patina that has served the discipline and its patients very well. To allow the fundamental advances in understanding of pathophysiology and disease mechanisms to become separated from clinical diagnosis and treatment will weaken the intellectual basis of our discipline, erode creativity that derives from the clinical issues that generate the hypotheses being tested in the laboratory, and ultimately affect patient care. Whether at meetings or in journals, the proximity, interaction, and link between science and clinical medicine must remain strong and vital. For the ASN, which best exemplifies that link in nephrology worldwide, JASN is the most visible example of the commitment to keeping science and medicine together. It is not an easy task for a journal to maintain that balance and to foster those linkages, but the current editorial team has worked very hard to do so. I strongly urge the new team to continue to meet that challenge by publishing the best material available in both basic and clinical disciplines and avoiding the easier path toward becoming only a basic research journal. There are other challenges as well, too numerous to comment on here, including the need to achieve complete transparency in disclosing relationships between authors and industry, the need for constant vigilance against plagiarism and “double publishing” data, the need to invent new ways to deliver more information in the digital age electronically, the need to continue to decrease time from acceptance to publication to maintain currency, and others. Before closing, I thank all of the individuals who have worked so hard in the past 6 years to make JASN the top-ranked journal that it is today (shown in part in Figure 1). First, thanks to my two predecessors, Jared Grantham, the first and founding editor of JASN, and Craig Tisher, who turned over to us 6 years ago a journal that was already at the top of its field. Bonnie O'Brien in Gainesville has served the journal as Managing Editor since its founding in 1990 and will continue in that role; to many authors and reviewers, Bonnie is JASN, and she deserves a large share of the credit for what the journal is today. Special thanks to Allison Eddy, my deputy editor, whose depth of expertise in both basic science and clinical pediatrics has served the journal extremely well, especially in the area of invited material. Thanks to Carol Hill, our editorial assistant in Seattle, whose organizational skills, weekly agendas, “to do” lists, and gifted eye for cover illustrations have kept Allison and me on track and JASN covers pretty for 6 years. 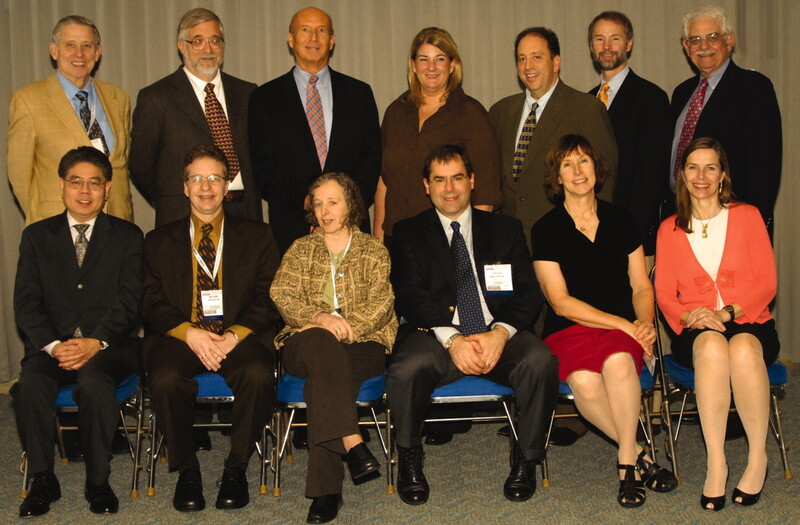 The current JASN editorial team photographed at the 2006 American Society of Nephrology Renal Week meetings in San Diego, CA; November 14 through 19 2006. From left to right, front row: Peter Igarashi, Associate Editor; Peter Heeger, Associate Editor; Allison Eddy, Deputy Editor; Jonathan Himmelfarb, Associate Editor; Carol Hill, Editorial Assistant; and Agnes Fogo, Associate Editor. Back row: Eberhard Ritz, Associate Editor; William McClellan, Associate Editor; William Couser, Editor-in-Chief; Bonnie O'Brien, Managing Editor; Glenn Chertow, Associate Editor; Ray Harris, Associate Editor; and David Warnock, Associate Editor. The high standards and quality of the journal reflect the hard work of the associate editors who read the papers, assign the reviewers, and interpret the reviews. Eberhard Ritz has served JASN as associate editor for 11 years through full terms of two editors. His formidable knowledge in several fields and unique ability to identify and interpret important papers in nonrenal journals gave birth to “Nephrology beyond JASN,” a feature that will end with this issue but that has provided readers some truly seminal and creative analyses of several important topics in renal medicine. Bill McClellan, the founding father of the first Clinical Epidemiology and Outcomes category in a renal journal, and Peter Igarashi, responsible for Genetics and Development, have each served full 6-year terms with distinction. Charlie Alpers, David Churchill, Bill Owen, Mo Sayegh, Victor Schuster, and Stuart Shankland also set high standards for this team in the first 3 years. Their successors, Glenn Chertow, Agnes Fogo, Ray Harris, Peter Heeger, Jon Himmelfarb, and David Warnock, have maintained and increased those standards more recently. Special thanks also to the more than 100 individuals who have served JASN on the Editorial Board and the thousands who have reviewed papers for us in the past 6 years. Joanna Matthews, Bob Henkel, Kim Taylor, and particularly Bob Fulcher have handled the publication and business end of JASN at ASN headquarters with skill and dedication. With that, I hand JASN over to a new editor-in-chief, Eric Neilson, a long-time friend and colleague, and to one of our associate editors, Ray Harris, who will now serve Eric as deputy editor. JASN is fortunate to be in the hands of such skilled and experienced physician-scientists who, I am completely confident, will meet the challenges mentioned here and take the journal to even greater heights in the years ahead. It has been a special privilege for me to have had the opportunity to serve the ASN in this capacity and to set the course for JASN and thereby participate in shaping the discussion about advances in the field of nephrology for the past 6 years. It has been a good, no, actually, a great run!